What finally makes the cut tells me something about who I am, and is a somewhat sobering reminder about what the U.S. is known for in other parts of the world. More than anything else, I’ve beefed up on electronics, computer gadgets, tiny mp3 players, cables, and adapters. 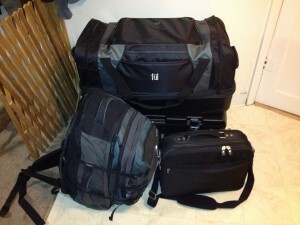 Specifically, I’ve got 3 tablets, 3 laptops, a collection of desktop computer guts like hard drives and RAM, portable hard drives, flash drives, 10 mp3 players, two digital cameras, a gigantic flat-screen monitor, and whatever other electronic devices I carry with me that have practically become chained to my body. I can pat myself on the back because not all of these techno-trinkets are for myself; many of them are gifts. But I stop to think about the gifts I’ve brought back and try to think if I’ve brought anything with soul. Any spices. Crafts. Anything made from natural elements like wood or metal. Any art? Instruments or tools? I’ve brought things like books and clothes and a few hobby items… but really, what do I bring to Costa Rica that communicates U.S.A. to people? What would they be expecting me to bring? What could I bring that represents my country as anything but a cheap retail store for imported consumer electronics? Is that all we are known for? There’s more, isn’t there? And there’s more that I take back with me than just a material collection of techno-trinkets and entertainment, isn’t there? And the conviction that haunted me before I left for six months in the U.S. continues to hound me… I’m going back for more than just a shopping trip, right? There’s more to us than that, isn’t there? There’s more to me than that… right? People see me as more than just a connection to consumer culture? What if I arrive empty-handed… with nothing. Will people even care to see me? I recall TV commercials for American packaged tourist trips that flash across our cable channels in Costa Rica. The offers are for American tourist destinations (“American” with a capital “A”, i.e. all the Americas in the Western Hemisphere), and are geared toward Latino tourists. They include 5-day trips to Machu Picchu in Peru, or wine-tasting in Chile, or Mayan Ruins in Guatemela, or Scuba Diving in Belize. A slightly more expensive, and shorter tourist package, is to visit the United States during one of our most important yearly cultural celebrations: Black Friday. The commercial tantalizes viewers with images of shopping malls and smiling families swinging bulging shopping bags next to popular retail stores. Take advantage of the best sales of the year, and return to your country with suitcases full of merchandise from the land of plenty!